Greetings and salutations from the mitten! My husband and I recently bought a home with some acres and are now ready to start a family. Naturally now that we are out of an apartment its puppies first, so we are excited to have a Mal on the way. We wanted one more puppy so they could grow up together with us and after some research, discovered the gorgeous Tamaskan. After seeing the controversy concerning the breed, we decided to hold off purchasing a puppy until we know for certain that it will be safe and legally protected here. Michigan is one of the states that made it illegal to have a wolf or hybrid. Thanks so much for this resource! We appreciate any heads up on puppies that are not going to be considered hybrids by the state. Welcome! I think most lines actually don't have wolf content, as far as I know there were only two lines out of the foundation dogs Jodie and Whitefang (Henki and Valko) and most Tamaskans from those lines are many generations removed from them anyway. There's also the recent Sylvaen litter from a mid content AWD. I'd get in touch with the USA breeders Hawthorne, White Elk, Tarheel, Adawe, Halcyon etc and see what breeding dogs they have and whether any of them come from these lines so that you know what to avoid just in case. Adawe currently has a litter but I think they're probably all reserved, so you'd also have to ask who has upcoming litters planned Hope this helped. rosemont wrote: Welcome! I think most lines actually don't have wolf content, as far as I know there were only two lines out of the foundation dogs Jodie and Whitefang (Henki and Valko) and most Tamaskans from those lines are many generations removed from them anyway. There's also the recent Sylvaen litter from a mid content AWD. I'd get in touch with the USA breeders Hawthorne, White Elk, Tarheel, Adawe, Halcyon etc and see what breeding dogs they have and whether any of them come from these lines so that you know what to avoid just in case. Adawe currently has a litter but I think they're probably all reserved, so you'd also have to ask who has upcoming litters planned Hope this helped. 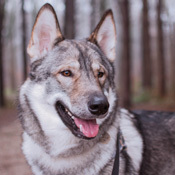 I don't know if Michigan would consider Czechslovakian Wolfdogs (CWD) and Saarloos Wolfdogs as wolfdogs since I believe the CWD is listed as a FCI breed with the AKC. Nearly all lines have CWD through Oskari since the 6 foundation dogs from Polar Speed kennels in Finland are either Oskari's offspring or his grandpups. Another CWD was added as a foundation dog (Yukon) last year - a few of his pups went to breeding homes but are too young to be health tested. A Saarloos was used as a foundation dog in 2009. The sire of Adawe's litter has Valko in his pedigree through his sire and Oskari through his dam. Both Oskari and Valko appear 3 generations back. 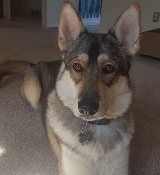 arianwenarie wrote: I don't know if Michigan would consider Czechslovakian Wolfdogs (CWD) and Saarloos Wolfdogs as wolfdogs since I believe the CWD is listed as a FCI breed with the AKC. See, that is where I get really confused because Michigan's law on wolf hybrids is so incredibly broad. It even lists wolf hybrid and dog pairings specifically as dogs that will need to follow the strict rules and regulations. Even though the CsV is considered a dog breed by the AKC's FCI, they are technically still wolfdogs. Hawthorne and Moondance are the only kennels in the US who have potential breeding females where Oskari appears in the 5th, 6th and 7th gen. Of course since Ruuq and Tlun are outcross pups out of Freyja and Arrow, they will likely be bred back to a Tamaskan which would put Oskari and/or Valko somewhere in the 3rd, 4th or 5th gen depending on which stud is used. Btw, I am not trying to start a debate or otherwise pick a fight...just trying to sort all this out. Lol. arianwenarie wrote: Of course since Ruuq and Tlun are outcross pups out of Freyja and Arrow, they will likely be bred back to a Tamaskan which would put Oskari and/or Valko somewhere in the 3rd, 4th or 5th gen depending on which stud is used. Arrow also has wolf content further back in his ancestry. 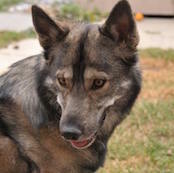 arianwenarie wrote: Even though the CsV is considered a dog breed by the AKC's FCI, they are technically still wolfdogs. I don't think they are, most CSVs now are F5 at least which is classed as a dog. Even if Oskari has an F2/F3 in his lines, you said it was 4th and 5th gen, meaning that any of the Tams in Oskari's lines are even further away from any Wolf heritage. If Michigan's wolfdog laws are for anything higher than F5 then CSVs should be perfectly fine, especially because they're legal in all states anyway. I'm not picking a fight either btw! I just think the wolf content in Oskari lines now is negligible. Interesting. I didn't know that. The only info I have on Arrow's pedigree only goes back to his grandparents. But the Hedlund Husky is primarily Husky, no? rosemont wrote: I don't think they are, most CSVs now are F5 at least which is classed as a dog. Even if Oskari has an F2/F3 in his lines, you said it was 4th and 5th gen, meaning that any of the Tams in Oskari's lines are even further away from any Wolf heritage. If Michigan's wolfdog laws are for anything higher than F5 then CSVs should be perfectly fine, especially because they're legal in all states anyway. Some lines that go back to Valko have been crossed with those that have Oskari. (i.e. Sequioa/Jaeger, Leia/Dylan, Rhea/Darwin). If memory serves me correct, Blustag's Golden litter has Jodie in their pedigree. None went to breeding homes. This was a line breeding between Heidi/Bodie. Heidi is out of Sara/Valko. Sara's sire is Hero, who I believe was a mid or low-content WD. Bodie is a Jodie/Jackal pup. There was a Jodie/Jackal pup that went to Tsonata kennel but failed hips, so they decided not to breed. I know there is one Jodie/Jackal pup that passef health tests not owned by Blustag, also in the UK, named Annu. Just shedding some light on the Michigan Wolf Hybrid Laws- I called the Dept of Agriculture and spoke to the vet who represents the Michigan wolf laws. From our conversation ANY dog with known wolf in its pedigree is considered illegal. Including the CWD - I explained the content has become negligible due to wolves really only being used in the foundation of the breed, but I was assured these were still considered illegal. I stressed that I found the law to be highly subjective as all dogs came from wolves at some point, but was told again, any known wolf ancestry was what the law was regarding to. Currently in legislation they are trying to change the law so that any AKC recognized breed could be allowed - but this is still only in the beginning stages. If this is the case then that means no Tamaskans, ANCD's, or anything of the sort are allowed in MI? Unfortunately I would have to say yes, that is the case. Though there are a few Tam/ANCD owners here as well as CWD breeders. The law is really poorly written (purposefully vague). I didn't even know about it until a couple months ago when I was considering an ANCD as a second dog and called to check (wolf content a lot closer in pedigrees than that of the tamaskan). I don't think the intent of the law would be that Tams specifically would be considered an illegal breed- but I didn't specifically mention tamaskans to the rep, just talked about CWDs...I have my tam registered as a dog in the city we live in, and I don't think there would be any reason for anyone to be suspicious about tams. Hopefully some changes do get made to the current law though.